In this scene, Katniss has just learned that Peeta joined the Career pack and manages to use the fire that the girl from the previous night lit to stay warm. I took a photo of the rabbit in leaves from my avocado tree because I didn’t think roasted rabbit on a tarp would make for a great photo. Besides, when they cook other rabbits later in the games, I think they wrap them in leaves then. Something to note, avocado leaves make pretty good plates! I had bought some meat at Costco to grill for a Game of Thrones dish and since hubby convinced me that starting a fire out of mango tree branches was a questionable practice, I decided to go back and look at the actual book text to see how her first rabbit roasting really went down. Imagine my delight when I realized that just hanging my rabbit over some coals would have all the authenticity I needed. I had thought that I needed an open fire! Hubby had slaughtered our rabbits about a month ago and so this one was waiting in the freezer for quite some time until I had the motivation to finally do this. I defrosted it today and then cut it up with kitchen shears. I admit I cheated a little and didn’t make a spit out of branches, mostly because I had no idea which branches the dog had slobbered all over and it seemed pretty gross to chance it. I tried metal skewers, but the legs kept swiveling around and I could only cook one side. 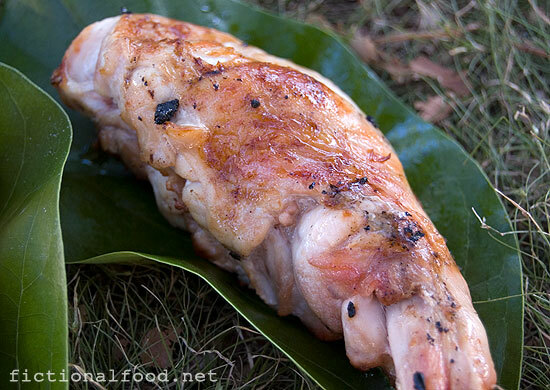 Eventually, I held the rabbit legs over the grill with my tongs until one side was nicely golden brown, then just laid it on the grill to cook on the other side. Yes, I got lazy. I was holding each leg up for at least 10 minutes before it got this nice and crispy! Just out of curiosity, I did not season these legs at all. I wanted to know what a piece of meat over a fire tastes like as-is, just like how Katniss had it and so after I dropped one leg in the grass, took the pictures, and gave the fallen leg to the dog, I took a bite of the other one. It was still hot and wow!! I couldn’t believe that a piece of meat with no seasoning could taste that good. I mean, it wasn’t popping my taste buds or anything, but it was still pretty darned good just by itself. My daughter, a rather sad-for-the-bunnies girl, came over and took a small bite and then promptly snatched it from my hands and took it inside to eat for dinner. This was the fifth rabbit I’ve cooked and I have to say, grilling is the way to go. 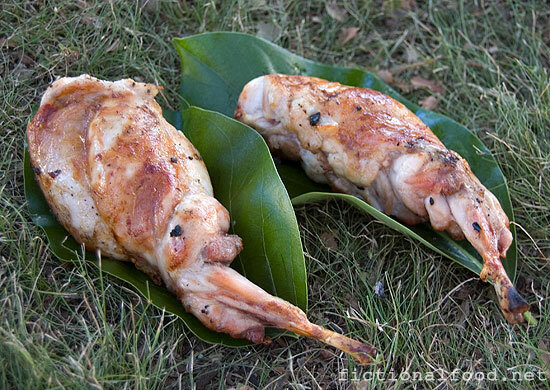 I was very pleased with the results I got with the rest of the rabbit, which I seasoned with a steak rub. It’s possible that residual seasoning from the other pieces of meat I’d cooked before were still present and therefore seasoned the meat, but I did make a point to place the bottom side of the rabbit on a part of the grill that hadn’t really touched anything. I also made sure I bit the part that I had held over the fire myself, so who knows. I may have to try it again and cook the unseasoned rabbit first, but for now, I’d call this a tasty success!